Vep is a refugee in a terrible insect-driven colony, forced into servitude in a horrific alien landscape. In Prism Stalker, she’ll discover more about that awful world. And we’ll see if there’s anything she can do to change it. 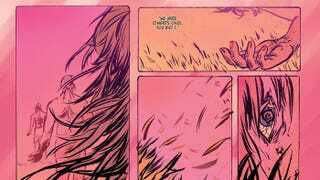 Published by Image Comics, Prism Stalker is a new psycedelic scifi comic series written and drawn by Sloane Leong (From Under Mountains), with lettering by Ariana Maher (Ringside). io9 is thrilled to be able to premiere the first nine pages from issue #1, which will be released in March 2018. ﻿PRISM STALKER will launch in March, written and drawn by Sloane Leong (FROM UNDER MOUNTAINS). The eye of opportunity is closing. Vep is a young refugee, raised away from her devastated home planet as an indentured citizen in a foreign colony. She works tirelessly for her insectoid hosts, but there is no exit in sight in this viscous, dripping citynest. Her duty is to her family and her siblings, but what more can she do for them here? The answer appears faster than she is ready for. Check out the pages below, which craft a stunning world out of color and word, ruminating on an alien tragedy but also on colonialism, heritage, and home.